Ecofieldtrips Pte Ltd is a Singapore based company which employs specialist biologists to cover the biology of rainforests, mangroves, seashores and coral reefs in the unspoilt ecosystems of Tioman Island, Sarawak and Langkawi, in Malaysia. School groups from Singapore, Malaysia, Hong Kong, Bangladesh, UK and Ireland come annually on the fieldtrips. Fieldtrips vary in length and content- from fun filled educational trips with 11/12 year olds to in-depth GCSE, A-Level and IB survey work- depending on school requirements. The “hands on” field experience and the knowledge and experience of EFT biologists ensures a better understanding of our wonderful ecosystems and how they are interrelated. The fieldtrips support what is being taught in the classroom and it is hoped that fieldtrip experience leads to life long conservation awareness. Ecofieldtrips Pte Ltd is a Singapore based company which employs specialist biologists to cover the biology of rainforests, mangroves, seashores and coral reefs in the unspoilt ecosystems of Tioman Island, Sarawak and Langkawi, in Malaysia. School groups from Singapore, Malaysia, Hong Kong, Bangladesh, UK and Ireland come annually on the fieldtrips. Fieldtrips vary in length and content- from fun filled educational trips with 11/12 year olds to in-depth GCSE, A-Level and IB survey work- depending on school requirements. The “hands on” field experience and the knowledge and experience of EFT biologists ensures a better understanding of our wonderful ecosystems and how they are interrelated. The fieldtrips support what is being taught in the classroom and it is hoped that fieldtrip experience leads to life long conservation awareness. Mangroves seem to have little appeal to the general public and are commonly referred to as “hot, bug infested, smelly swamps that are polluted and mess up the coastline” They are frequently cleared to allow for better sea views or reclaimed to provide more flat land for buildings and aquaculture. The terrible tsunami tragedy of Dec 2004 brought to light the vital function of mangroves in protecting coastal areas during times of adverse weather conditions. During fieldtrips in Sarawak students see exactly how mangrove forests are being cleared to make way for housing development. They also visit a wonderful kampong that nestles amongst the mangrove trees and observe how people can live in harmony with nature. Mangroves have many other important roles, they are the nursery ground for juvenile fish and crustaceans, they provide food, medicines and a sustainable source of good quality timber for the local people. Mangroves are the home to many creatures such as fruit bats, snakes, monkeys, birds and butterflies. Mangroves are a specialised group of plants that have adapted to living in the fringe of land between the sea and the land, along coasts and riverbanks where fresh and salt water meets. Here few other plants can survive the harsh environmental conditions. Mangrove plants have adapted to accommodate daily flooding by seawater when the tide is high and exposure to the hot rays of the tropical sun when tide flows out. Mangroves frequently have to survive freshwater flooding when streams overflow during the rainy season. 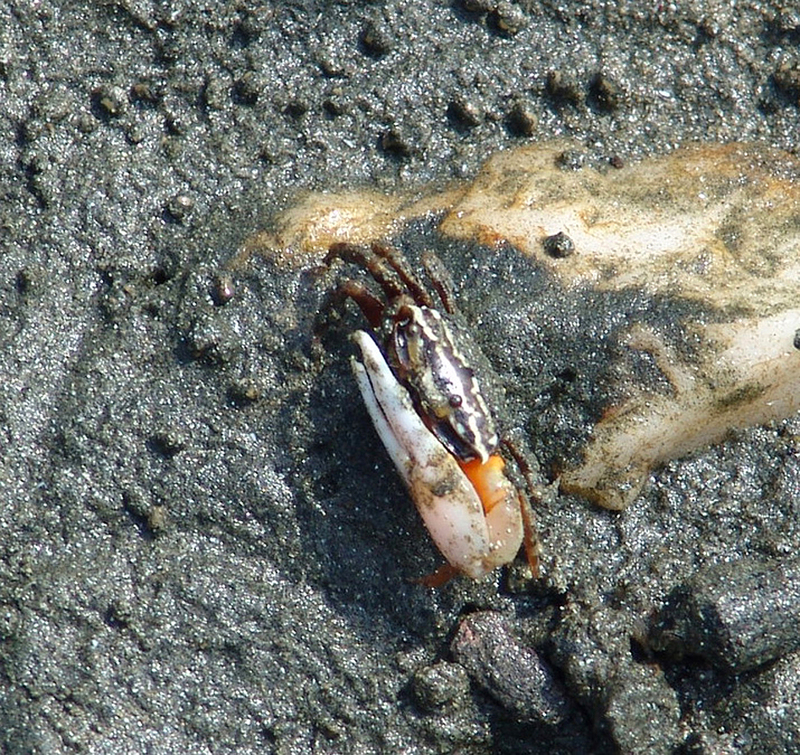 Mangrove soil is waterlogged and anaerobic with sulphur producing bacteria giving off the distinctive odour of rotting eggs! The strange roots of mangrove trees often protrude upwards allowing air to diffuse into the plant tissue through specialises pores when exposed to air. This ingenious adaptation works in much the same way as a snorkel when skin diving. Mangroves are without doubt what students know least about when they arrive to take part in a fieldtrip and EFT biologists introduce mangroves to students in a variety of ways. The first introduction to mangroves is from the rainforest by following a stream which then meanders through a wonderful estuarine mangrove before it reaches the seashore. It is often the case that students find themselves waist deep in water wading through the mangrove. It is this journey from the rainforest to the seashore through the mangrove that makes students realise how ecosystems are interconnected. Students also approach mangroves from the sea by snorkelling into mangroves at high tide. This gives a very different perception of mangroves and students can well imagine how mangrove roots are a refuge for smaller fish and how they provide such a good barrier against coastal erosion. 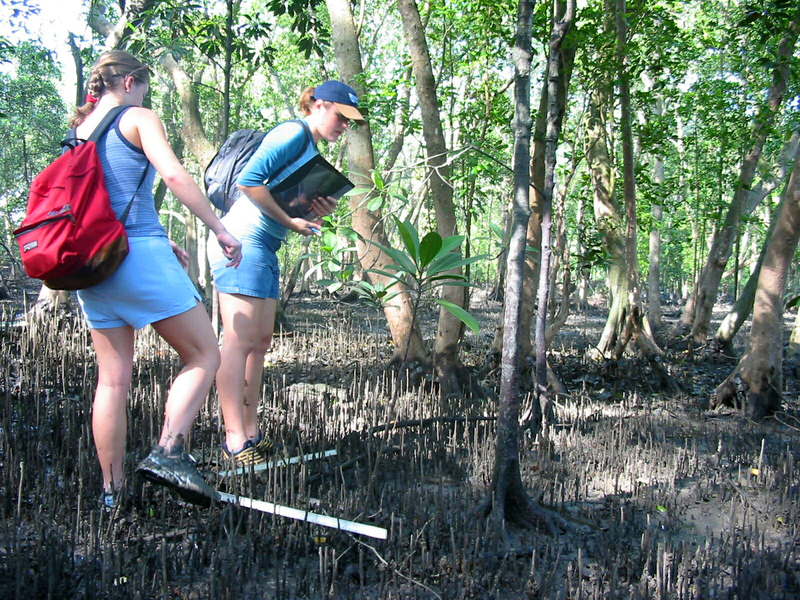 Students also spend time doing more detailed surveys in mangroves. This may involve small groups working together to learn as much as possible about a given area of a mangrove forest. A variety of survey techniques are used including a silent survey to observe the timid animals that emerge when they are not disturbed. Mangrove zonation, using quadrates and transect lines are carried out as well as water and soil sampling. The affect of pollution and particularly human impact is brought home to students during their surveys.